Classes are on hold because Maarten currently lives in Shanghai China. Seminars and private lessons can be organised on request when Maarten is temporarily in Switzerland. No experience is required. Everyone who's interested in improving their personal health by practicing Tai Chi Chuan is welcome, from total beginners to more advanced practitioners that like to focus on the essence of Tai Chi Chuan. The principles of Tai Chi Chuan are rooted in Chinese philosophy and knowledge that have developed over thousands of years. Tai Chi Chuan is an internal martial art, which means it does not depend on brute strength but emphasises the power of the mind and intrinsic energy flow. The theory is very rich and encompasses a system of self-defense, a physical expression of Taoism, a form of meditation, and a system of health and healing. Benefits of practicing Tai Chi Chuan include improved balance and coordination, calmness of mind, concentration, stronger bones, muscles and organs. 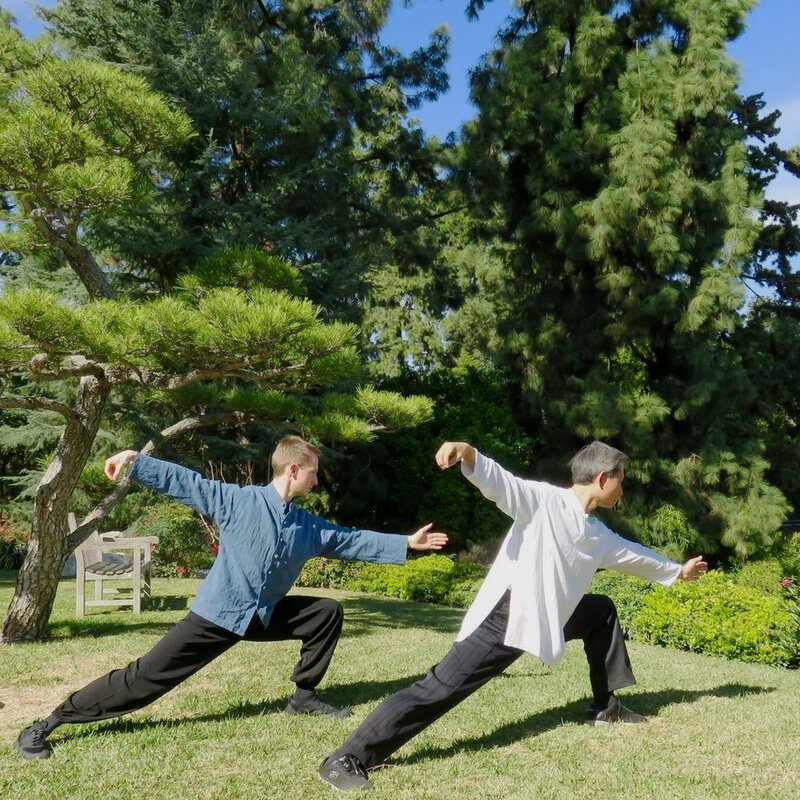 The essence of Tai Chi Chuan training consists of four fundamental exercises that are critical to develop internal strength and to improve health. All students are encouraged to train the 4 foundations. Meditation is a practice that makes it possible to cultivate and develop positive human qualities. This mind-training allows us to transform our way of perceiving things and improves the quality of our lives. Our mind is like a monkey, scattered thoughts are all over the place, however by calming down our mind we can become free and focussed. A calm and peaceful mind is attuned to inner processes such as breathing, tension of muscles and Chi (Qi) circulation. Stretching relaxes the body, quiets the mind and increases overall flexibility. This is important to keep our body adaptable and less susceptible to injuries. It facilitates the flow of lymph and serves to massage, nourish and cleanse our body. Flexibility of the body and mind go hand in hand. Breathing naturally is key to control our mind in order to lead our Chi in all Tai Chi Chuan movements. Horse Stance (or Ma Bu) is the most basic training method to develop internal energy and strength. Stance training also helps to relax deeply and gain a strong sense of balance or "root". Tai Chi Chuan is based on thirteen patterns or eight basic techniques and five maneuvering steps. The eight techniques are Peng (ward off), Lu (roll back), Ji (press), An (Push), Cai (pluck), Lie (split), Zhou (elbow), and Kao (bump). The five steps are Jin Bu (forward), Tui Bu (backward), Zuo Gu (beware of the left), You Pan (look to the right) and Zhong Ding (central equilibrium). Students first learn the basic patterns and gradually learn to apply wave and circular motions. The thirteen patterns are at the root of all postures in Tai Chi Chuan forms and all martial applications . After learning the fundamental patterns, making all movements natural and soft, students can more easily learn any form and start to apply Tai Chi Chuan in life. Tai Chi Chuan forms are sequences of martial art movements that promote students health, when performed slowly and mindfully, and allow students to train combat skill, when performed fast. Various styles were developed over hundreds of years. The Chen-style is characterized by circular movements of different sizes with clear martial applications. The Yang-style is derived from the Chen-style and is characterized by slower gentle movements, hence ideal for beginners and older students. Tai Chi Chuan is all about Yin and Yang. This concept is most clearly applied in forms. Every posture is a combination of the 8 techniques and 5 steps, in which Peng and Sung permeate throughout the body from beginning to end. Peng is a rising energy while Sung is an alert way of relaxation. Peng and Sung are each other’s counterparts, i.e. Yin and Yang. By practicing the postures of the form with no interruption and stepping in a centered way, students learn to feel the flow of internal energy. Chi Kung, which literally means “the art of energy”, is an integral part of Tai Chi Chuan. By calming down the body and mind, Chi Kung sequences help students to have a deep feeling of internal energy, or Chi, along paths in the body. This feeling is the language of mind-body communication. Developing internal energy is necessary to be effective in martial applications and develop good health. Dao Yin refers to a set of Chi Kung movements that is excellent for improving one’s health with a focus on joints, muscles and tendons.